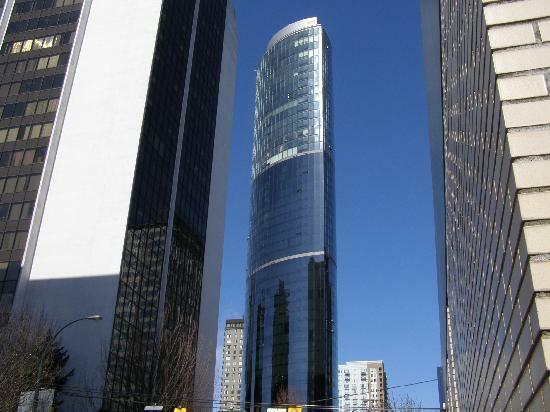 Challenge: Climb 48 flights (or 739 steps). Straight up. 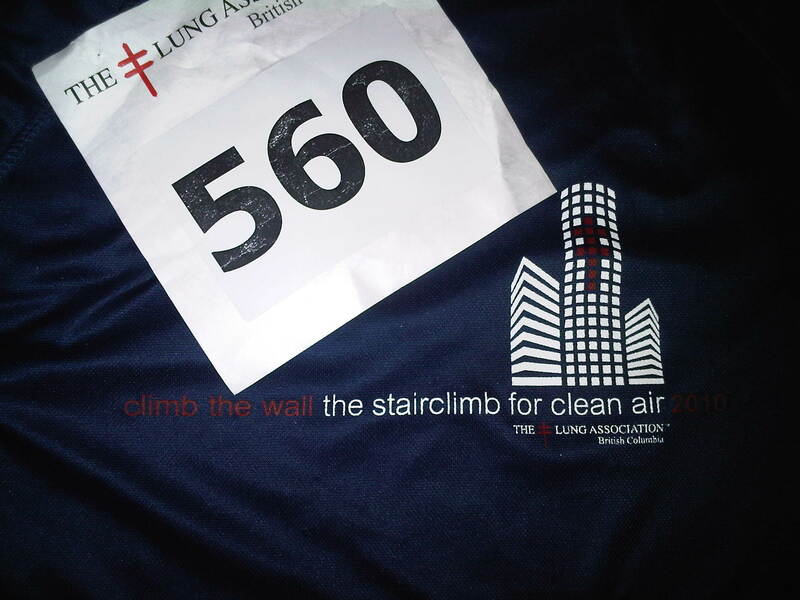 All in support of research for the BC Lung Association and their 9th annual Climb the Wall: The Stairclimb for Clean Air fundraiser at the Sheraton Vancouver Wall Centre Hotel. Challenge Accepted: Before signing up, I prepared myself by going to the gym and using the ‘ol StairMaster. 10 minutes of ‘training’ later, feeling strong and confident and ready for any challenge, I signed up assuming this was all the training I needed. I would soon find out that I was so very, very wrong. The night before the event, I planned to do some yoga stretches, have a large salad with a side of pasta for dinner (carbo- loading), drink plenty of water and then get to bed early. With healthy plans made, I imagined nothing would get in the way. After all, no one will want to go out on a rainy Saturday night anyway, right? 2:15AM: Hey, weren’t you supposed to be asleep by now? Home at the crack of 2:45AM, I intelligently reset my alarm from 8:35AM to 8:45AM. There. That should do it. Grammatically speaking, I really don’t need to bold and capitalize the word FIREFIGHTERS. However, after meeting a menage of them in person I realize now that there’s definitely a physical need to emphasize the word FIREFIGHTERS. I’ve seen them on TV and in the movies but I have never really seen or paid attention to them in person. Consider me a newfound fan. Captain of the fan club in fact. Ooof. Where was I now? Registration taken care of and my free shirt & climber # in hand, I met up with some of my teammates. Immediately, I noticed the many firefighters in the area. 6 foot plus, broad shouldered, dark haired and gorgeous, I’m forever grateful to my outgoing friend for getting the attention of these nearby specimens and beginning a conversation with these 2 gorgeous lads. She estimated their ages to be around 20 to 25 years old. I simply estimated their ages to be ‘old enough’. Swooning, I ask their take on the stair challenge versus the StairMaster. Handsome #1 replies: Completely different. Handsome # 2 chimes in: It doesn’t prepare you for this stair climb at all. 2 days of training out the window. My heart starts to beat rapidly in my chest. Partially from staring at that droplet of sweat on Handsome #2’s neck that I want to wipe off (with my body) but mainly from the challenge ahead. With the warm-up and stretches complete, there’s nowhere left to go but up. As my turn at the stairwell approaches, I’m given the green light to go. Step 1 (48 flights to go): Cheers and hoots and hollers and it’s all for me! I think to myself as I sprint down the hallway and up the stairs, “I can do this, woo!”. Flight 8 (40 flights to go): I catch up to my friends and slowly slip past them. They’re engaging in the slow and steady pace method whereas I’m employing the ‘go as fast as you can before your body realizes what’s going on and slows you down’ method. In a scientific study, both methods proved to be equally effective. Flight 16 (33 flights to go): An un-amused teenager in a monotone tells me I can do it and wishes me luck. For some reason, I don’t feel her sincerity. Flight 21 (How many damn flights are left?! ): I have long since stopped sprinting. The walls are closing in on me. And I never knew I could breathe so loudly. Is it really only me breathing this heavy in here? Flight 28 (20 fricking flights to go): the sound of my own breath now annoys me. And those cheering morons at every flight are starting to tick me off with their canned hurrah’s and phony encouragement. Just so you know – “Only 20 flights to go!” is NOT encouragement when your thighs only have 18 flights left in ‘em. Flight 34 (too many #$& flights left): I seriously look at the exit door to the right and consider it for a second. Then I remember the sign at flight 20 or so that states: “Only losers take elevators!” or something along those lines. Flight 43: A large sign announces: “Only 5 flights to go!” I want to take that sign and shove it down the throat of whoever had the balls to make it. I bet you he never walked up 739 #$& flights of #$& stairs. Flight 48 (0 flights to go): What? I’m here? I’m alive!? Oh yay! Thank goodness. I hug the cheering darlings and take their proffered cups of lukewarm water (I assume the bringer of ice has to take the stairs…) Strangers in the recovery break room hi- five and congratulate each other on a job well done. The room smells as well as you’d think a room that’s had 400 sweaty people passing through it would. Then add 100+ more. They send us down via the elevator back to the main area where we’re met by a feast of fresh fruit, pastries, bagels, cupcakes, coffees and teas and lots of water to help us recover. A wonderful event made even better by the continued presence of many FIREFIGHTERS to congratulate us and thank us for our efforts (no mister firefighter sir, thank you). The organizers continue to applaud us and announce our times will be posted later that day and/or on the website the next day. After stretching, getting some coffee and noshing on a bagel or 6, we pat ourselves on the back, take one last long, long look at any remaining firemen and get ready to head out. Oh and my official TIME to climb 48 flights of stairs or 739 steps: 31st place (out of 235 women), coming in @ 8 minutes and 13 seconds, woo! However, I swear it felt like an eternity so I assume they rounded down.